SUMMARY: Histologic patterns of cellular architecture often suggest a tissue diagnosis. Distinctive histologic patterns seen within the peripheral nerve sheath tumor schwannoma include the Antoni A and Antoni B regions. The purpose of this report is to review the significance of Antoni regions in the context of schwannomas. Microscopically examined histologic patterns of cellular architecture on stained tissue preparations may imply a specific tissue diagnosis. Pathologists rely on these patterns much as radiologists rely on gray-scale patterns on images. The histologic patterns known as Antoni A and Antoni B regions have been recognized as highly suggestive for the peripheral nerve sheath tumor schwannoma. The purpose of this report is to review the significance of Antoni A and Antoni B regions in the context of schwannoma. What Are Antoni A and Antoni B Patterns? In 1920, Nils Ragnar Eugène Antoni (1887–1968), a Swedish neurologist and researcher working at the Royal Neurologic Clinic of Stockholm under the supervision of the eminent neuropathologist and now controversial eugenics proponent Frithiof Lennmalm (1858–1924), described 2 distinct patterns of cellular architecture in the peripheral nerve sheath tumors, which would become known as schwannomas.1 Antoni, who would later become professor of neurology at the Karolinska Institute in Stockholm, based his observations on analysis of 30 cases and described a “fibrillary, intensely polar, elongated appearing tissue type” which he called “tissue type A.”1 These highly cellular regions were eventually referred to as Antoni A regions by later authors. Antoni also described seemingly distinct loose microcystic tissue adjacent to the Antoni A regions, and these came to be known as Antoni B regions. Recognition of these patterns has proved useful in the histologic identification of schwannomas. Current concepts in the classification of peripheral nerve sheath tumors have evolved over many decades. In Antoni's time, researchers labored intensely to identify distinguishing features that would allow consistent differentiation of subtypes of these tumors. Now the rubric “peripheral nerve sheath tumor” actually defines several unique pathologic entities including schwannoma, neurofibroma, perineurioma, traumatic neuroma (nonneoplastic; all benign), and malignant peripheral nerve sheath tumor (MPNST). Diagram of a schwannoma. The tumor (T) originates within a Schwann cell cylinder that surrounds an axon. The tumor subsequently grows, eccentrically compressing the normal adjacent axons. Schwann cell cylinders surrounding axons (light brown), endoneurium (dark yellow), and perineurium (tan and dark brown). 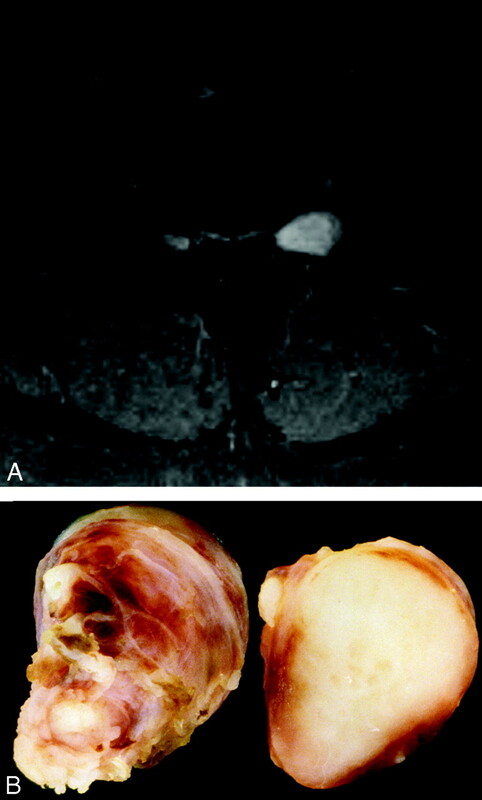 Photograph of surgical resection specimen of an intradural schwannoma arising in a 53-year-old woman. A, The yellowish tan gross specimen exhibits a thin capsule. B, Cut section of the tumor reveals a uniform, solid parenchyma. 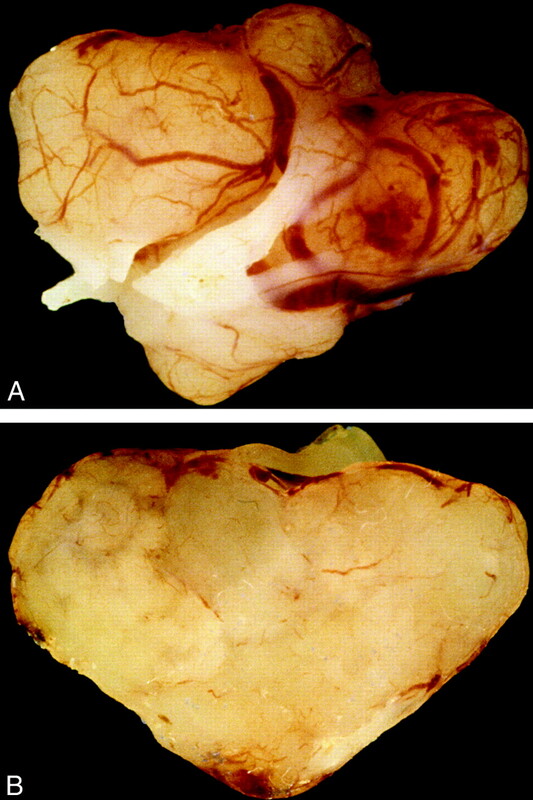 Architecture of schwannomas may vary and also exhibit cystic or nodular consistency. Vestibular schwannoma. 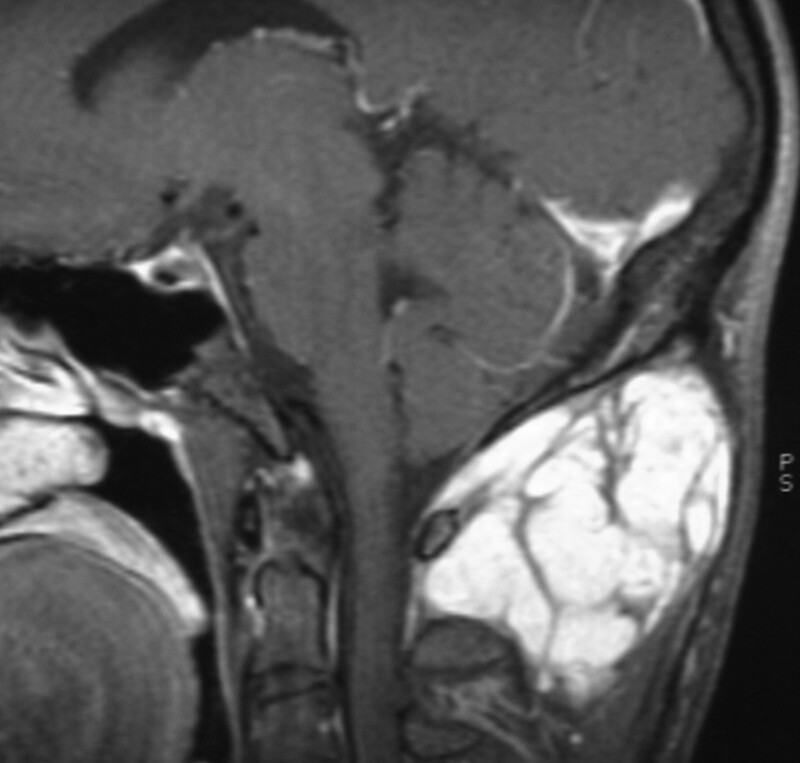 Enhanced T1-weighted MR image demonstrating a large predominantly cystic schwannoma arising from cranial nerve VIII within the internal auditory canal. The tumor fills the cerebellopontine angle, compresses the pons, and displaces the fourth ventricle. 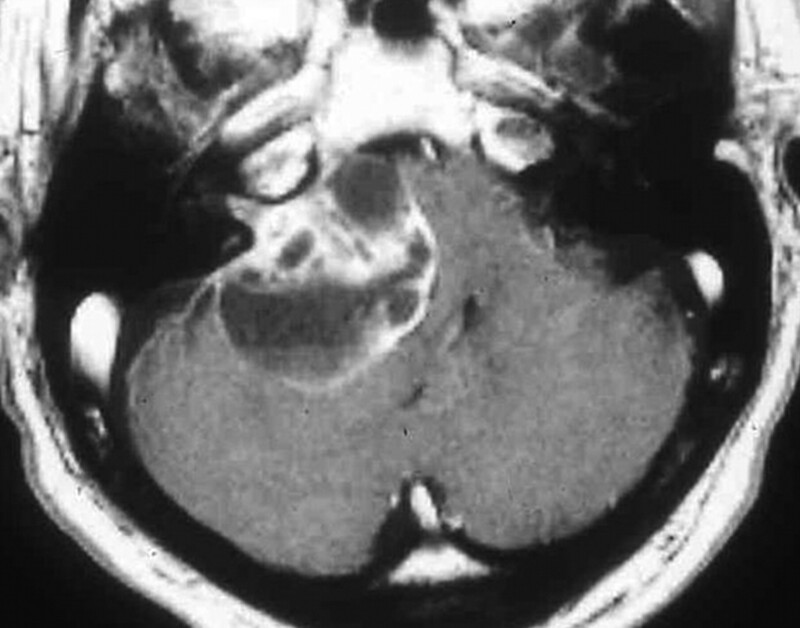 Debris settles within the dependent portion of the tumor. By contrast, neurofibromas appear to contain all the cellular elements of a peripheral nerve, including Schwann cells, fibroblasts, perineurial cells, and axons. The tumor cells grow diffusely within and along nerves, causing the nerves to expand radially while entrapping native neural elements within the substance of the tumor (Figs 4 and 5). 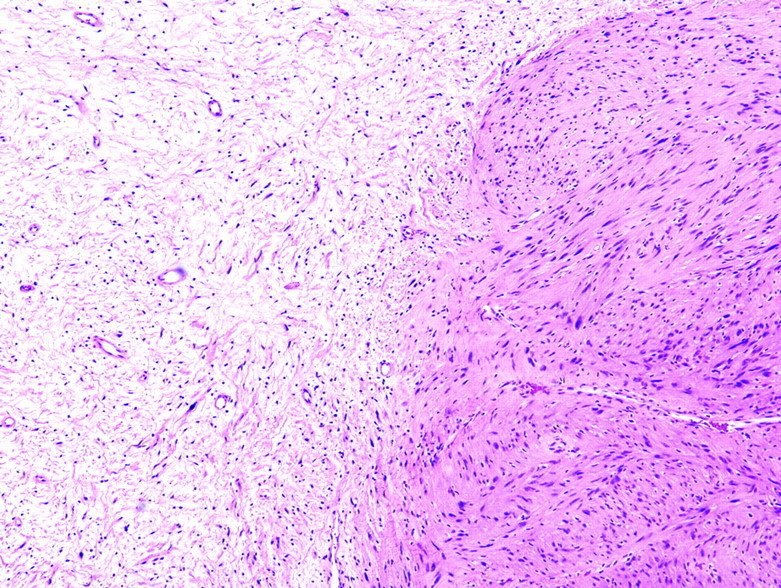 This intraneural growth pattern, with its entrapped axons, provides a key feature to histologically distinguish neurofibroma from schwannoma. When a neurofibroma involves multiple branches of a nerve plexus or multiple fascicles within a large nerve, it adopts and amplifies the normal anatomic tortuosity to produce a “plexiform” growth pattern that some authors have likened to a bag of worms (Fig 6). Plexiform neurofibromas most commonly occur in the orbit, neck, back, and inguinal areas, most occurring in patients with neurofibromatosis type 1 (NF1).2 Although benign lesions with a generally favorable prognosis, the ultimate treatment outcome for both schwannomas and plexiform neurofibromas depends largely on size, location, and proximity to important anatomic structures. Diagram of a neurofibroma. The endoneurium (dark yellow) increases in volume. Schwann cell cylinders (light brown) separate from one another and become dolichoectatic. 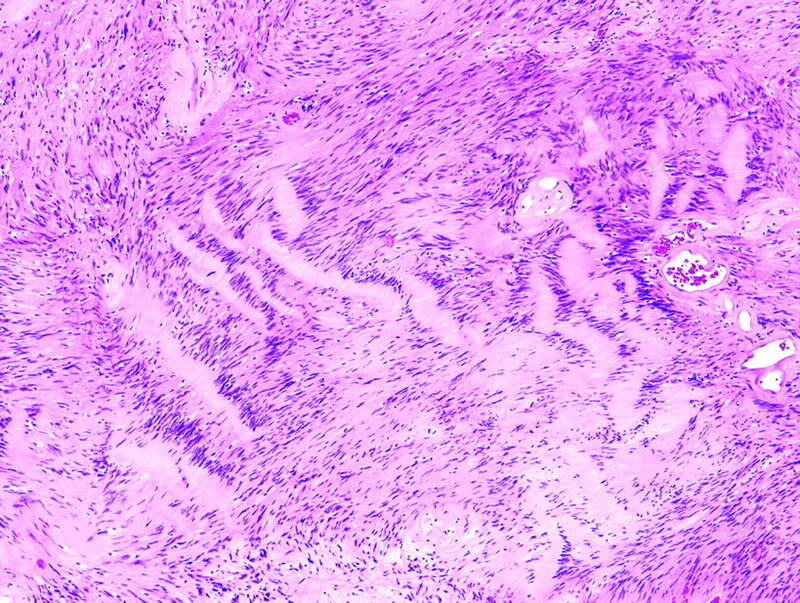 The mature tumor consists of a complex of Schwann cells, axons, and fibrous material within a myxomatous matrix surrounded by a thickened perineurium (tan and dark brown). Solitary neurofibroma in a 34-year-old woman. A, Enhanced fat suppressed T1-weighted MR axial image at the L4–5 level demonstrates an enhancing tumor arising from the left L4 root. The neuroforamen is expanded. B, Photograph of cut sections of the gross specimen in the same patient shows a solid heterogenous-appearing tumor, which has grown within and expanded multiple fascicles of the nerve. Plexiform neurofibroma in a 21-year-old man with no other signs of NF1. Sagittal enhanced T1-weighted MR image demonstrates an enhancing serpentine mass in the pontine soft tissues of the neck. Other categories of “peripheral nerve sheath tumor” also exist. For example, traumatic neuroma typically arises in the setting of injury to a peripheral nerve, as the name implies (eg, brachial plexus injury associated with obstetric delivery); the resulting mass develops from the nerve's regeneration and a fruitless attempt to re-establish its connections. Histologically, the mass appears as a jumble of benign-appearing nerve minifascicles interwoven with reactive fibrous tissue.2 Perineuriomas are exceedingly rare, representing less than 1% of nerve sheath tumors.4 They most commonly affect peripheral motor nerves, but sensory and cranial nerve involvement has also been reported.5 These tumors are formed by neoplastic perineurial cells arranged into “pseudo-onion bulbs” around axons within the perineurium and endoneurium of nerve fascicles. Thus, axon entrapment distinguishes both perineuriomas and neurofibromas from schwannoma. In contrast, “extraneural” (ie, soft tissue) perineuriomas do not display entrapped axons. The latter are not encountered in the CNS and are, therefore, not discussed further. The MPNST may develop either de novo or from transformation of a plexiform neurofibroma in a patient with NF1.6 Very rarely, MPNST may arise from a benign schwannoma.7,8 Histologically, MPNST appears as an invasive hypercellular spindle cell lesion with only subtle features to distinguish it from other sarcomas. Clinically, MPNST appears in the same areas as plexiform neurofibroma, but the common sites of origin that impact the CNS are cranial nerve V and the spinal roots; cranial nerve VIII is only rarely involved.9,10 Unlike schwannoma and neurofibroma, which are benign tumors with favorable prognosis, that of MPNST is generally poor. Metastases may develop in the lung, liver, and brain, and, therefore, primary treatment is usually aimed at local control through wide excision when possible. Chemotherapy and radiation therapy are also considerations. Photomicrograph of Antoni A tissue within a schwannoma. Wavy, tightly organized nuclear palisades known as Verocay bodies occupy the center of a highly cellular field (hematoxylin-eosin, original magnification ×400). Electron microscopy of Antoni A tissue demonstrates long interdigitating cell processes covered by a nearly continuous well-formed external layer or lamina and separated by intercellular basement membranes.14–16 Fisher and Vuzevski17 described these cytoplasmic processes as more numerous, longer, and more oriented into parallel bands than those seen in other tumors, such as neurofibromas. These ultrastructural findings correlate with the prominent palisades and Verocay body formation seen in this tissue type. The nearly ubiquitous basement membrane found in Antoni A regions is rich in laminin, a high-molecular-weight glycoprotein, and is produced by Schwann cells at all stages of development.18,19 Miettinen et al20 investigated benign and malignant soft tissue tumors immunohistologically for the presence of laminin. The results showed intense laminin positivity in schwannomas and neurofibromas and less intense positivity in leiomyomas and leiomyosarcomas, whereas fibrous histiocytomas and fibrosarcomas generally were negative. The immunohistochemical demonstration of attenuated intercellular laminin is, thus, a valuable aid in differentiating between tumors derived from Schwann cells and those derived from fibroblasts.20 Another component of basement membrane, collagen type IV, provides analogous antigen that is often targeted with diagnostic immunohistochemistry in clinical pathology laboratories. Photomicrograph of Antoni A tissue and Antoni B tissue within a schwannoma. The highly cellular Antoni A region on the right of the field is contrasted with the loosely organized hypocellular Antoni B region on left of the field (hematoxylin-eosin, original magnification ×400). Neoplastic Schwann cells in vitro show increased angiogenic properties similar to other tumor cells.29 The vascularization of these Antoni B areas is varied, sometimes aberrant or bizarre, but often contains degenerative features. Acute and chronic thrombosis, hemorrhage, and hyaline thickening of these ectatic vascular walls can be seen. Areas of frank necrosis further contribute to observed cystic regions. Within type B tissue, areas of so-called “ancient change” may also be seen. Twisted cytoplasm and enlarged hyperchromatic and markedly atypical nuclei may be present without increased cellular attenuation or mitotic activity to denote anaplastic change. Prominent fibrous stroma is rarely punctuated by attenuated bands of hyalinized cartilage, particularly in mediastinal tumors.30 Cysts as described above, focal calcification, and mucinous and xanthomous change involving the tumor cells are also common and thought to represent a degenerative phenomenon. Xanthomatous changes can produce areas that are yellow to the naked eye and that demonstrate aggregated foamy macrophages. Lymphocytic infiltrates are also relatively common. In the 80 years since Antoni described the features of schwannoma, pathologists continue to rely on histologic patterns for tumor diagnosis and grading. However, the understanding of molecular biology and protein expression has greatly impacted our understanding of these tumors. Even with this very basic understanding of the different molecular features of schwannoma and neurofibroma, one might predict that future diagnoses will be rendered (and treatments applied) on the basis of genetic or even proteomic analysis. Currently, however, differentiating these entities relies heavily on histologic features, such as those described by Antoni. In summary, Antoni A and B tissue types represent distinct histologic architectural patterns that aid in the pathologic diagnosis of schwannomas and may influence their imaging characteristics. Type A tissue is highly cellular and demonstrates nuclear palisading and associated Verocay bodies, which may reflect their prominent extracellular matrix and secretion of laminin. Type B tissue is loosely organized with myxomatous and cystic changes and may represent degenerated Antoni A tissue. Accepted after revision April 20, 2007.